This PDF e-book is 119 pages in length and is remastered from an original period embroidery book featuring both instruction and a mail order catalog of designs from the early 1900s. -Botany for the Needlewoman- Explaining parts of the flower, plus direction of stitch and creating stems. -Eyelet Embroidery. Also called Broiderie Anglaise. Illustrated instructions on how to create this type of embroidery. Initials- Including three designs to frame them and two alphabets of letters. Also how to use transfer paper. -Embroidered Lingerie and Costumes- Including a images of completed blouses, a suit, and undergarments, which could be sent away for mail order. These can provide inspiration for your designs. --Roman Embroidery- Also called Cut Work. 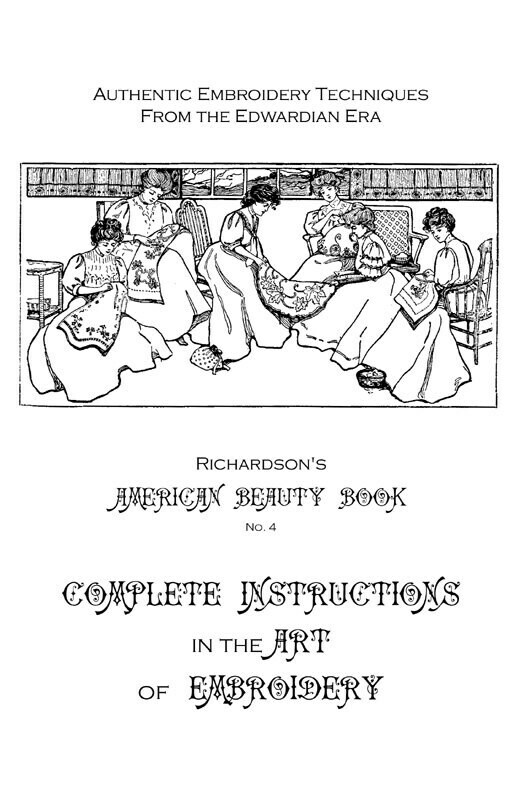 Includes both illustration for explaining technique, built upon what was previously learned, and mail order designs that could have been purchased. -Danish embroidery technique.A sort of cut work embrodiery on linen. Directions for making as well as some mail order designs are given. -Shadow Embroidery- Including written instruction, patterns for butterflies, and mail order embroidery designs to accent shirtwaists. Three of the designs have been enlarged and are included in the back of the book. -Designs for Coronation Cord- Written instruction and images of mail order designs. -Biedermeier Embroidery- In 18th Century German style- includes an image of a mail order pattern and an explaination of what it is, but no instruction. -Cleaning tinted articles, to mount photo frames, cheap pillows, and finger shields. -Tinted Pillows and Centerpieces- Showing mail order designs, which can be inspiration for your design. -Embroidery Patterns for the Floral Color Plates- 12 Designs Total, showing which color to use in a diagram, plus mail order designs for doilies that you can use as inspiration. -Renaissance Lace Or Needle Lace. No instruction, but a few images of mail order designs for inspiration. -Illustrating designs that could be sent away for, but can be inspiration for your design. Including memoranda tablet, laundry list, and a Japanese photo frame. This book dates to 1907 or before, as there is an ad inside which advertises a complete line of stamped linens as illustrated in the book until October 1907. This book was missing the original cover (which has been supplemented), but all pages have been remastered and this book includes the layout as it originally appears in the book, including 12 color plates of beautiful floral embroidery. Where the blank back of the color plates would have been in the book, I have provided a blank page, so the book retains the original flow and layout. This book also has been supplemented in the back with three large outlines of designs for embroidery for shirtwaist fronts- enlarged from the original small mail order designs in the book. The original size of this book was 5.5" x 8.5". This e-book has been remastered from original historic source material. This work may contain offensive language and cultural stereotypes of the period. They are included here as part of a historic work, as leaving them out would not present the work in it's entirety. The purpose of this e-book is to preserve embroidery techniques which are becoming a lost art. 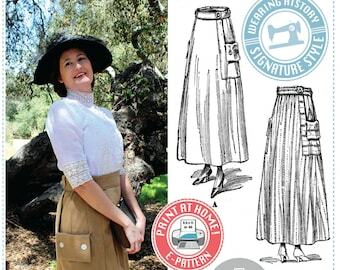 Wearing History does not share the societal views of this historic work in any way. This PDF e-book is 119 pages in length. It is 12.78 MB in size. Since this is a large file, please make sure you are connected via a high speed connection before attempting to download this book. Prefect for my Wonder Woman CosPlay!